Sleeping Cars | American Train Vacation | 817-696-1507 | America's Trains Inc. The accommodation layout, plumbing and equipment on old sleeping cars makes them unsuitable for conversion. America’s Trains sleeping cars are rebuilt ex passenger coaches with modernized systems and much larger rooms. Typical sleeping cars only include sleeping accommodations. Some other types of cars may also have some bedrooms. Previous sleeping accommodations on available cars in the USA were small with up to 12 or more rooms or compartments in a single car, most sharing bathroom facilities. 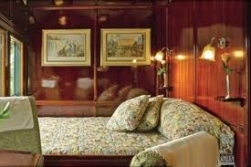 America’s Trains’ sleeping cars have five or six deluxe bedrooms each with full private bathrooms. Some may also have a small private lounge. Cars are completely rebuilt; designed for optimum comfort. Journey by Rail train bedrooms have television, music, and Internet access (most of the time, depending on location). Passengers can select their preferred type of bed linen and pillows. The full bathrooms (with shower) have hairdryers and every necessary guest accessory. Plush bathrobes, slippers, 24 hour room service and optimum service is provided. The quality and decor of bedrooms provides distinctive comfort.